ROME -- The Dignitatis Humanae Institute has announced the appointment of the regal Lord Nicholas Windsor as Chairman and leading philanthropist Mr Ilyas Khan as Vice Chairman. The Institute for Human Dignity was founded in 2008 by Nirj Deva MEP and Benjamin Harnwell, who were part of the team which successfully launched the Working Group on Human Dignity in the European Parliament. It aims to promote human dignity in political and cultural spheres worldwide. Its basis is the "Universal Declaration of Human Dignity", a series of articles drawn up by Catholic lawmakers, which recognise the value of every single human life. His Eminence Cardinal Renato Raffaele Martino, Honorary President of the Institute said he was “proud to welcome Lord Nicholas Windsor and Ilyas Khan”. Lord Nicholas, 41, is the son of the Duke and Duchess of Kent and first cousin to Queen Elizabeth II, he was born twelfth in line to the Throne, but forfeited the claim when he became a Catholic in 2001. He is a patron of the Right to Life Charitable Trust, and of Bromley Mind, a mental health charity. In these capacities he has worked with other respected pro-life leaders in Europe and the United States. Lord Nicholas said he was “immensely pleased” to have been appointed. He added: "Defending the dignity of all human beings, and especially the innocent unborn, those most at risk, is one of the most important and urgent challenges we face today.” He also noted the delicate approach required saying that it requires “moderation and sensitivity” and “reasoned debate”. Ilyas Khan is Chairman of Leonard Cheshire Disability, the world's largest charity serving people with disabilities and also Chairman and major shareholder of Accrington Stanley Football Club. 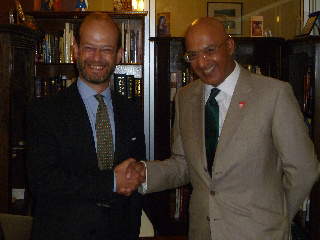 Nirj Deva MEP, President of the International Committee on Human Dignity in the European Parliament, said: "Ilyas Khan has a worldwide reputation as an entrepreneur and philanthropist. I am absolutely thrilled and delighted to be welcoming someone with his profile as our Vice Chairman. He will be a great asset." Khan said he was “very honoured” to be appointed as Vice Chairman. He added: “I offer my wholehearted support to this venture.